Letterpress Cards — Keva, Ink. 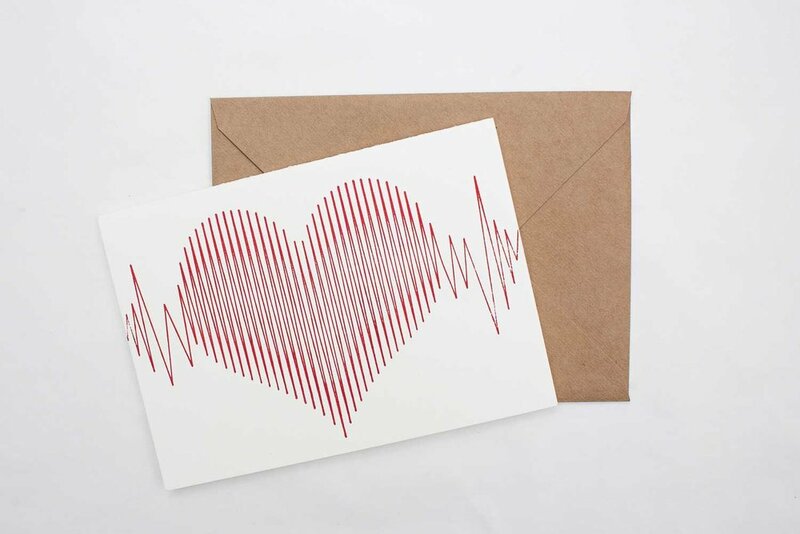 Letterpress cards are all printed on 100% cotton paper, with soy or rubber based ink, come with a recycled paper or matching cotton envelope, and are packaged in an Eco-compostable sleeve. All our cards are printed on 100% cotton paper, with soy or rubber based ink, come with a recycled paper or matching cotton envelope, and are packaged in an Eco-compostable sleeve. Size A1. Available as double sided flat prints with rounded corners in sets, or as single cards. Size A2. Blank inside. Comes with matching cotton envelopes. 5 inch square card with recycled red envelopes. Please note, square cards require extra postage at USPS. Size A6. Blank inside. Comes with recycled grocery bag paper envelopes. Size A1. Blank inside. Comes with brown paper bag or recycled green envelopes. Size A2. Inside printed with the message "Wish away." Comes with recycled blue envelopes. Size A2. Blank inside. Comes with recycled yellow envelopes. Size A7. Comes with recycled red envelope. Available blank inside, or printed with the message "Love Blooms" with an attached pack of seeds, and printed Papaver rhoeas beneath. Size A1. Blank inside. Comes with recycled brown paper bag envelopes. Size A2. Blank inside. Comes with recycled brown paper envelopes. Size A2. Blank inside. Comes with recycled blue envelopes.